This is the advance reading copy of Talking God, the ninth book in Tony Hillerman's Navajo Mystery Series. The cover features a preliminary design by Peter Thorpe of the pictorial representation of Talking God with sandstone formations on either side and bordered by the image used to represent Rainbow God. There is also a banner across the lower right hand corner that says Advance Reading Copy. The back cover also states "This is an advance reading copy form an uncorrected manuscript. The regular edition will be in hardcover." In his book Tony Hillerman: a biography, Louis Hieb explains, "this advance reading copy reproduces computer generated copy using a letter quality printer. Issued to reviewers and members of the book trade." Binding: Paper covers with multicolor graphic on front. On the lower right hand corner, a dark purple banner with white print reads: ADVANCE READING COPY. 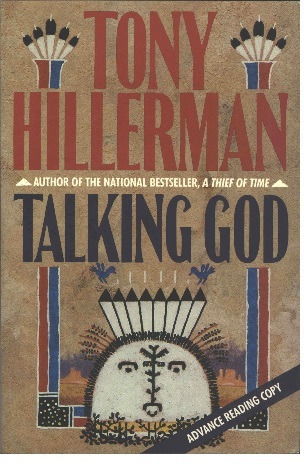 The Spine is lettered: TONY HILLERMAN | TALKING GOD | [publisher's device] with the author's name in red, the title in a dark purple and the publisher's device in white print.